FaceBook announcement here. 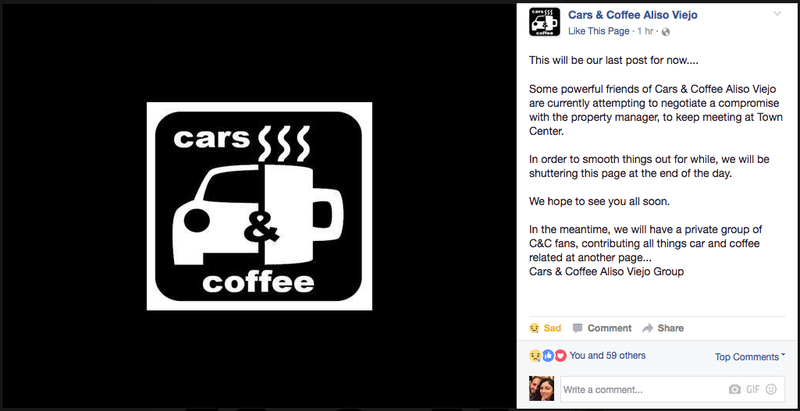 In what seems to be a fast paced, disturbing trend here in SoCal, another Cars and Coffee event has been shut down. 5 years ago there was dozens of meets every day of the week all over SoCal, and now it’s one or two a week here or there. Too many idiots attending now who feel the need to show off their 89hp shitbox or plow their pony car through crowds and planters, causing property managers to pull out support for the meet and not allow future car events, thus ruining the scene for the enthusiasts that just want to meet and hang out. It’s just really sad that one or two idiots have to ruin everything for a large group and throw away all the time and effort the organizers put into holding these events.